There is a lack of agreement regarding the scientific names and classification of the some 350 species of primates, and most contentiously, whether humans should be classified separately or be included with great apes. In a simple and traditional classification, prosimians—the earliest primates—include lemurs, lorises, and tarsiers. Anthropoids (simians) include monkeys, apes (gibbons, orangutans, gorillas, chimpanzees, bonobos), and humans. Biologists do agree, however, that humans did not evolve from apes, but rather, humans and apes had a common ancestor and diverged some 5–8 million years ago. Fossil records vary in age from 85–55 million years as to when our early ancestors made their debut, but the consensus hovers about 65 million years. These forebears were followed some 35–55 million years ago by species of lemurs and lorises, which had large eyes and brains, small snouts, and more erect body positions. The first monkeys appeared 35 million years ago, and 10–15 million years later, apes diverged from Old World monkeys. There are a number of characteristics seen to varying degrees among primates, arising from their arboreal history, but these are not necessarily unique to primates. (Most primates still live in trees, in the subtropics as well as in tropical rain forests of Africa, Asia, and the Americas.) Primate hands and feet have adapted for grasping, with specialized nerve endings that confer greater tactile sensitivity; flat nails are found on these digits and not claws. Apes and some monkeys have opposable thumbs that, as exemplified in humans, permit them to manipulate tools, including computer keyboards. The eyes are forward-looking and close together, which permits stereoscopic vision, with depth perception possible, an asset when swinging through trees. Monkeys and apes place greater reliance on vision as their primary sense rather than olfaction, as in other mammals. The most distinguishing characteristic of primates is their high degree of sociability and advanced cognitive skills. In ascending rank order of intelligence are New World monkeys, Old World monkeys, apes, and their cousins, humans. Primates have a slower rate of development than other mammals, with an extended period of juvenile and adolescent life, presumably a period in which to learn from elders. SEE ALSO: Mammals (c. 200 Million BCE), Neanderthals (c. 350,000 BCE), Anatomically Modern Humans (c. 200,000 BCE). 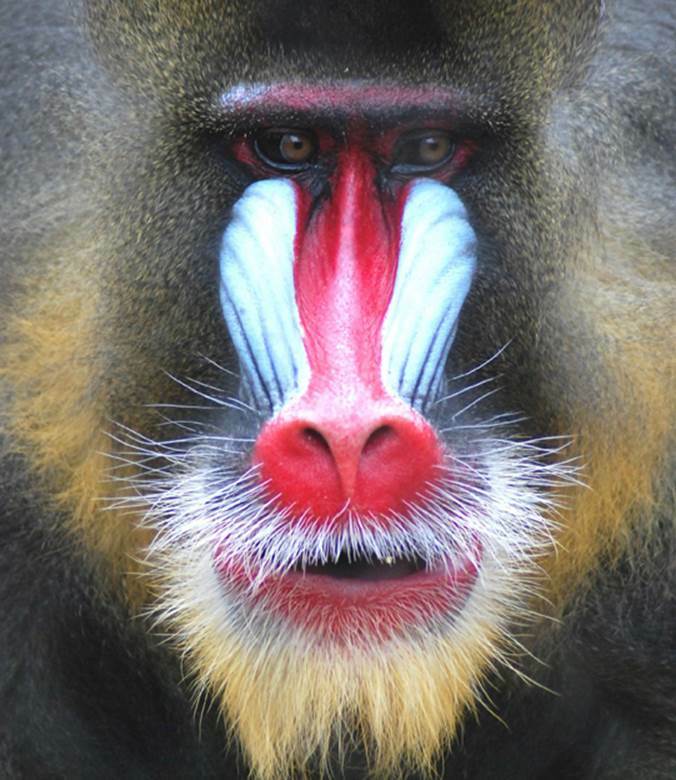 Mandrills, the most colorful primates, are Old World monkeys closely related to baboons. They live mostly in the tropical rainforests and forest-savanna mosaics of western Africa and can survive up to 31 years in captivity.